Start by choosing a sweater. Any type of sweater would work. 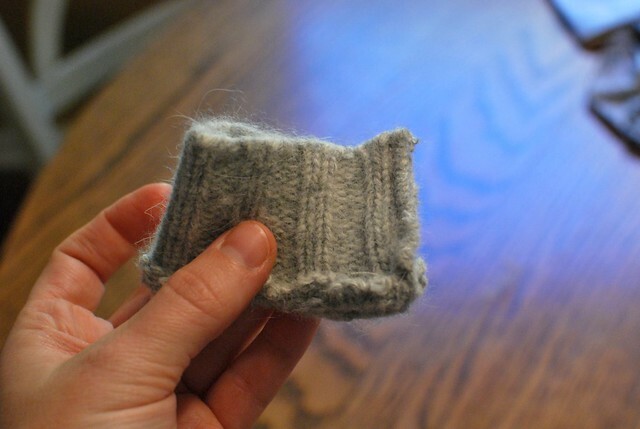 I had this sweater that was not 100% wool so it never felted. It was soft and cuddly and I liked the color. Since I was lining the whole scarf, I knew it would work perfectly. 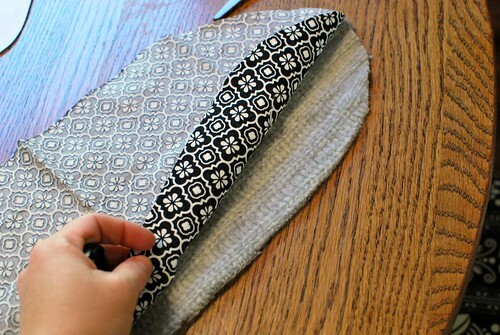 After you have your sweater and fabric picked out, make your pattern. 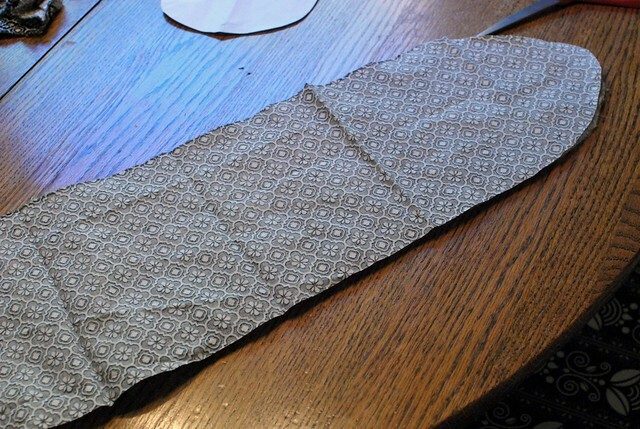 My pattern piece is 6 inches wide by 17 inches long. I rounded one end. 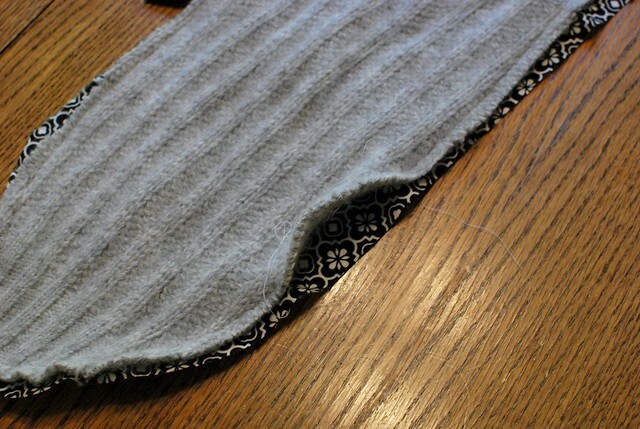 If your sweater is big enough you can line your pattern up on the fold to create one long piece. My sweater was not big enough so I had to cut 2 pieces and sew them together. If you cut 2 pieces, sew them together like I did below. 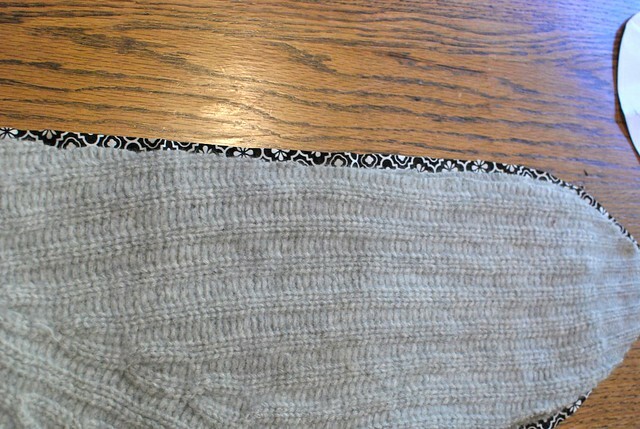 Then I folded my contrasting fabric in half and placed the sweater piece on top. 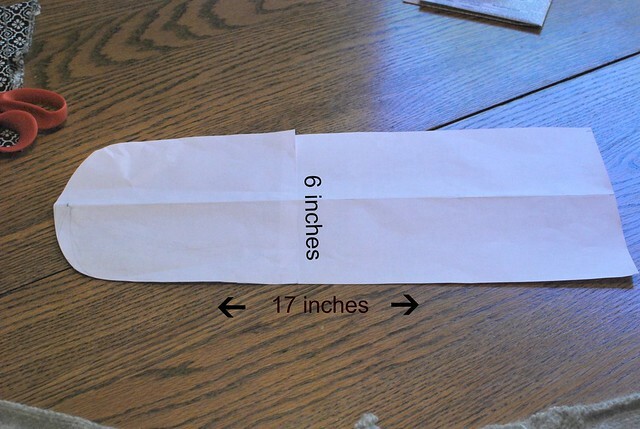 I wanted to make sure that the lining fabric was one piece so that there are no seams inside. I cut the lining fabric a little bigger in case the sweater stretched a little bit while sewing the pieces together. 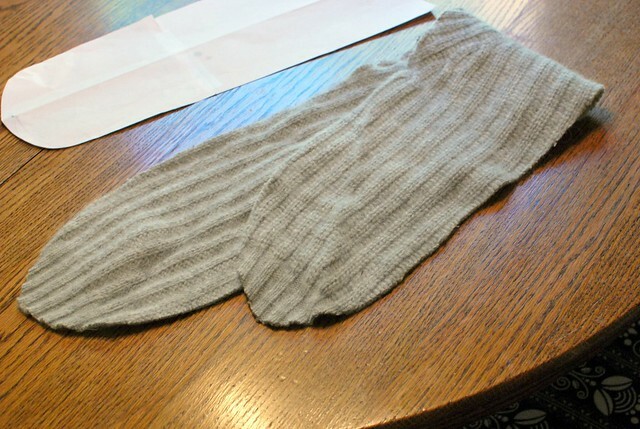 Place the sweater and lining fabric together with right sides facing. Then sew all the way around leaving a 3 inch gap for turning. Trim up the edges and clip the curves. 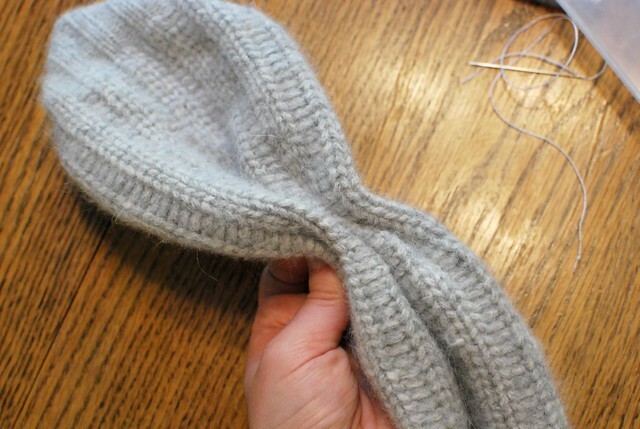 Then turn the scarf right side out through the opening. You could then top stitch all the way around the scarf. I chose to hand sew the opening close using a ladder stitch. Take one end and scrunch it together. I scrunched mine together about 7 inches in from the point. Then hand sew a couple of stitches through to secure it together. Repeat on the other side. 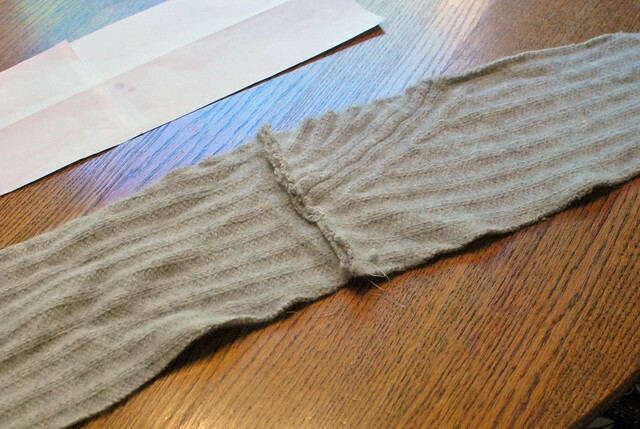 Take a 5 inch piece of sweater and sew the ends together to create a tube. Turn right side out. 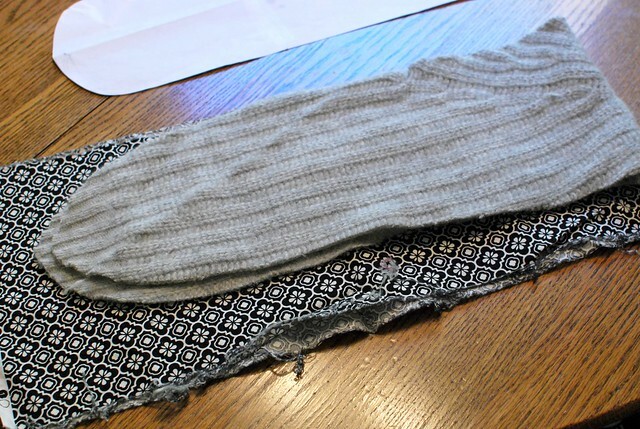 Then feed one side of the scarf through the tube placing it over where you scrunched. 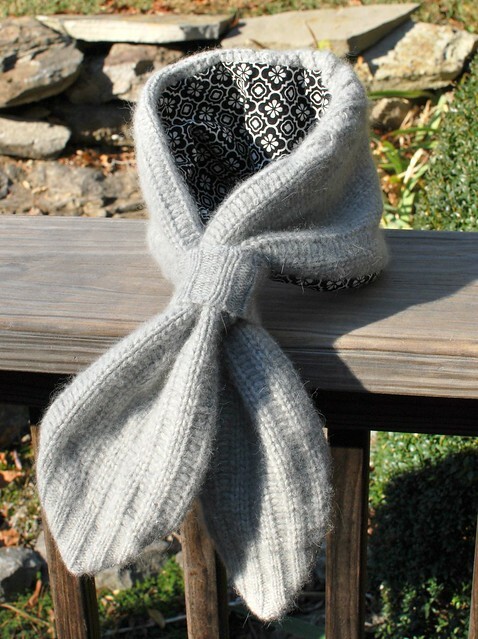 Now you can place it around your neck and squeeze the other side of the scarf through the tube to secure it around your neck. This is for personal use only. If anyone decides to make one, please add it to my flickr group. Very cute and easy! Thanks for sharing! Much better price than Anthro! you are awesome. What a great idea. :) Sorry I've been MIA...been taking a break. I have posted links to this tutorial on my blog. Please let me know if you would like me to remove it and I will remove it right away. I have changed my blog over to sharing all the wonderful tutorials I have found. Thank you for your tutorial!